Cannabis producer Tilray’s shares have risen and fallen at a rate that makes virtual currency bitcoin look lethargic. Its CEO claims it could have a 12-digit valuation. He’s half right. A producer of that size is likely one day, but assuming it will be Tilray is foolish. 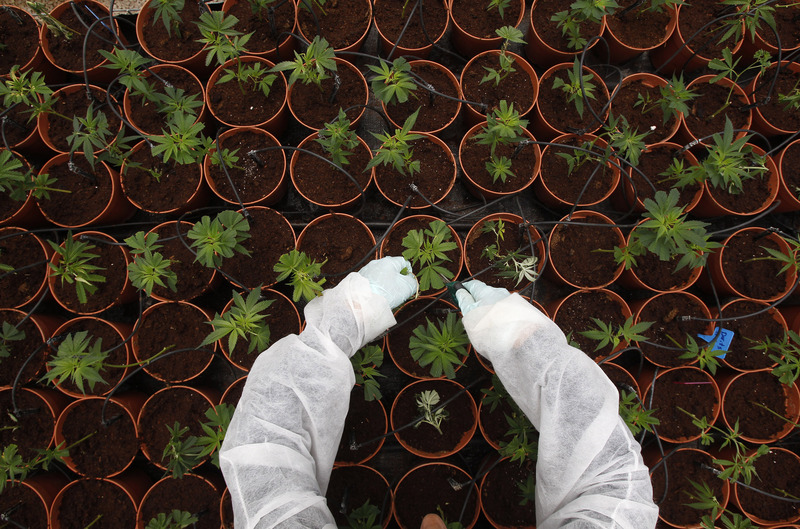 A worker tends to cannabis plants at a plantation near the northern Israeli city of Safed June 11, 2012. Shares in Canadian cannabis producer Tilray rose as much as 93 percent on Sept. 19, and then fell as much as 47 percent from their intraday peak during the following day of trading. The company’s share price has increased more than 10-fold since its U.S. initial public offering on July 19. Its market capitalization was $16 billion at the close of trading on Sept. 20. Chief Executive Brendan Kennedy believes the company could one day have a valuation of more than $100 billion, Bloomberg reported on Sept. 18. Aurora Cannabis, another Canadian producer, said on Sept. 20 that it planned to list its shares in the United States in October. The company’s shares are already traded in Toronto. Recreational cannabis becomes legal in Canada on Oct. 17. It has been legalized in nine U.S. states and Washington, D.C. Medicinal cannabis is legal in the majority of states. Both are illegal at a federal level.